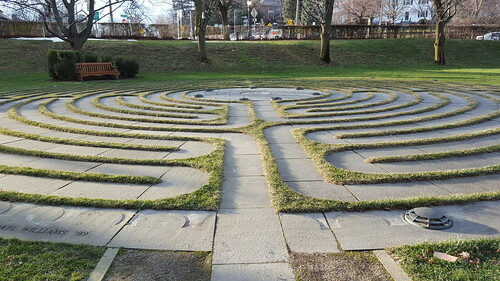 Today I’m supposed to get together with A (not her real initial), walking the labyrinth at Boston College then having potato pancakes at the diner in Newton Centre. Tomorrow J and I are going to Angell to adopt two cats–George and Gracie–that were surrendered by a breeder/hoarder in New Hampshire, a woman with 40 cats. They are shy and not well socialized–our job will be to get them acclimated into the house and also to get them comfortable around people. We’d intended to adopt just one cat to fill the spot left by Bunny when she died, but since George and Gracie find comfort in cuddling together, we didn’t want to split them. Nina and Gumbo continue to cuddle me whenever I sit on the loveseat in the master bedroom–Nina on my lap and Gumbo sprawled across my chest. Nina was incredibly shy when we first adopted her–she spent her first few weeks under the bed–but now she runs up and falls at my feet when I walk into the room, begging for a belly rub. And so we slowly socialize each of the cats we adopt. Frankie and Bobbi will never be lap cats–they’re too feisty and independent for that–but they each tolerate petting as long as it’s brief. The world is filled with suffering: so many bad, sad situations I am powerless to fix. But I know how to comfort cats and tend to dogs, and so I do that as a small act of devotion I offer to a suffering world. This is an entry I wrote in my journal on January 30, 2016, along with photos I took and promptly forgot about. I don’t remember what bad, sad situations I’m referring to in the final paragraph, but what was true then is just as true now. Nina and Gumbo continue to climb all over me, looking for cuddles, whenever I walk into their room, and Frankie and Bobbi are still as feisty as ever. And one year after we adopted them, George and Gracie now let me pet their heads but are otherwise shy.